Not to be confused with Freethought, Cognitive liberty, or Freedom of speech. "Without freedom of thought there can be no such thing as wisdom & no such thing as publick liberty without freedom of speech", Benjamin Franklin, 1722. Freedom of thought (also called freedom of conscience or ideas) is the freedom of an individual to hold or consider a fact, viewpoint, or thought, independent of others' viewpoints. Freedom of thought... is the matrix, the indispensable condition, of nearly every other form of freedom. With rare aberrations a pervasive recognition of this truth can be traced in our history, political and legal. The United Nations' Human Rights Committee states that this, "distinguishes the freedom of thought, conscience, religion or belief from the freedom to manifest religion or belief. It does not permit any limitations whatsoever on the freedom of thought and conscience or on the freedom to have or adopt a religion or belief of one's choice. These freedoms are protected unconditionally". Similarly, Article 19 of the UDHR guarantees that "Everyone has the right to freedom of opinion and expression; this right includes freedom to hold opinions without interference". It is impossible to know with certainty what another person is thinking, making suppression difficult. The concept is developed throughout the Bible, most fully in the writings of Paul of Tarsus (e.g., "For why should my freedom [eleutheria] be judged by another's conscience [suneideseos]?" 1 Corinthians 10:29). Although Greek philosophers Plato and Socrates had discussed Freedom of Thought minimally, the edicts of King Ashoka (3rd century BC) have been called the first decree respecting Freedom of Conscience. In European tradition, aside from the decree of religious toleration by Constantine I at Milan in 313, the philosophers Themistius, Michel de Montaigne, Baruch Spinoza, John Locke, Voltaire, Alexandre Vinet, and John Stuart Mill and the theologians Roger Williams and Samuel Rutherford have been considered major proponents of the idea of Freedom of Conscience (or 'soul liberty' in the words of Roger Williams). Queen Elizabeth I revoked a thought censorship law in the late sixteenth century, because, according to Sir Francis Bacon, she did "not [like] to make windows into men's souls and secret thoughts". 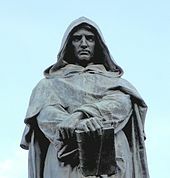 During her reign, philosopher, mathematician, astrologer, and astronomer Giordano Bruno took refuge in England from the Italian Inquisition, where he published a number of his books regarding an infinite universe and topics banned by the Catholic Church. After leaving the safety of England, Bruno was eventually burned as a heretic in Rome for refusing to recant his ideas. For this reason, he is considered by some to be a martyr for free thought. However, freedom of expression can be limited through censorship, arrests, book burning, or propaganda, and this tends to discourage freedom of thought. Examples of effective campaigns against freedom of expression are the Soviet suppression of genetics research in favor of a theory known as Lysenkoism, the book-burning campaigns of Nazi Germany, the radical anti-intellectualism enforced in Cambodia under Pol Pot, the strict limits on freedom of expression imposed by the Communist governments of the People's Republic of China and Cuba or by right-wing authoritarian dictatorships such as those of Augusto Pinochet in Chile and Francisco Franco in Spain. The Sapir–Whorf hypothesis, which states that thought is inherently embedded in language, would support the claim that an effort to limit the use of words of language is actually a form of restricting freedom of thought. This was explored in George Orwell's novel 1984, with the idea of Newspeak, a stripped-down form of the English language alleged to lack the capacity for metaphor and limiting expression of original ideas. More recently, the development of neuroimaging technologies have raised concerns about entities being able to read and subsequently suppress thought. Although the issue is complicated by the mind-body problem, these concerns form the emerging field of neuroethics and neuroprivacy. ^ Palko v. State of Connecticut , 302 U.S. 319 (1937). ^ "General Comment No. 22: The right to freedom of thought, conscience and religion (Art. 18) : . 30/07/93. CCPR/C/21/Rev.1/Add.4, General Comment No. 22. (General Comments)". United Nations Human Rights Website – Treaty Bodies Database. Office of the United Nations High Commissioner for Human Rights. 1993-07-30. Retrieved 2007-10-21. ^ Luigi Luzzatti, "The First Decree on Freedom of Conscience" p. 47 in God in Freedom. Retrieved 15 September 2014. ^ Brimacombe, Peter (2000). All the Queen's Men: The World of Elizabeth I. Palgrave Macmillan. p. 125. ISBN 0-312-23251-9. ^ The Committee on Science and Law. 2005. “Are Your Thoughts Your Own: Neuroprivacy and the Legal Implications of Brain Imaging.” Record of the Association of the Bar of the City of New York 60(2):407–37. Retrieved (http://heinonline-org.libproxy.berkeley.edu/HOL/Page?handle=hein.barjournals/rabbny0060&div=22&collection=barjournals). Voltaire (1954). "Liberté de penser". Dictionnaire philosophique. Classiques Garnier (in French). Paris: Éditions Garnier. pp. 277–81. 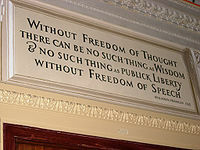 Wikimedia Commons has media related to Freedom of thought.